We made it through Wednesday—the hardest day of the week. Monday’s pure excitement, Tuesday and Thursday are solid work days, and Friday’s pure panic. But on Wednesday everyone’s tired and the reality of the challenge has set in. At least that’s been my experience. But this was a good Wednesday, with lots of good work done and folks still seemed cheerful at the end of the day. We made good progress on our house. We got the insulation in and the eave baffles in place early so the drywallers were able to move in and get their work done. Most of the siding went up and the porch is close to being done. 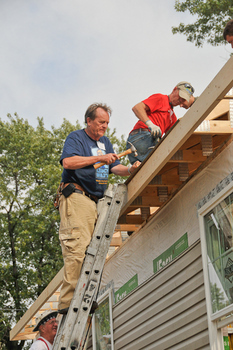 The roof has been a real challenge—it’s a hip roof and takes a lot of special cutting. It was finally done by the end of the day, but I figure we’ll need a little help to get it shingled. 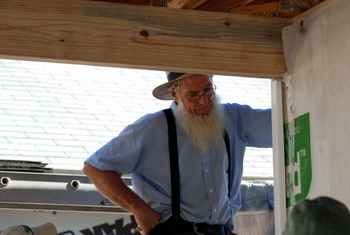 We did have one of the Amish spend some time with us, which is always a boon. The rest of the neighborhood is looking good. The new houses are coming right along and the rehabs are taking shape. The windows came in this morning, and most of the rehabs are getting them—they’ll make a huge difference in the livability of those homes. We call the rehabs Greater Blessing houses. These are projects that typically cost less than $5,000 and are done with families who own their home but need some help with health and safety updates. We don’t write loan documents for these project and don’t put a lien on them. Instead the family is given a box of envelopes and asked to repay the costs of the repairs as they are able with the knowledge that their payments will go towards helping other neighbors have a decent home as well. Jesus said that it is more blessed to give than to receive, so through this program we give families the opportunity of having the greater blessing. Big day tomorrow—we’ll be feeling the pressure of time as we see the week come to an end. I’m hoping that some of our partner houses will do the righteous thing and send us a helper or two—that would bring us up to speed. Check out the offical Legacy Build blog for links to other updates from the week.